“Why would you have an emergency situation that could be prevented?” asked Gill Phillips in her introduction to the London Ambulance Service mental health event. 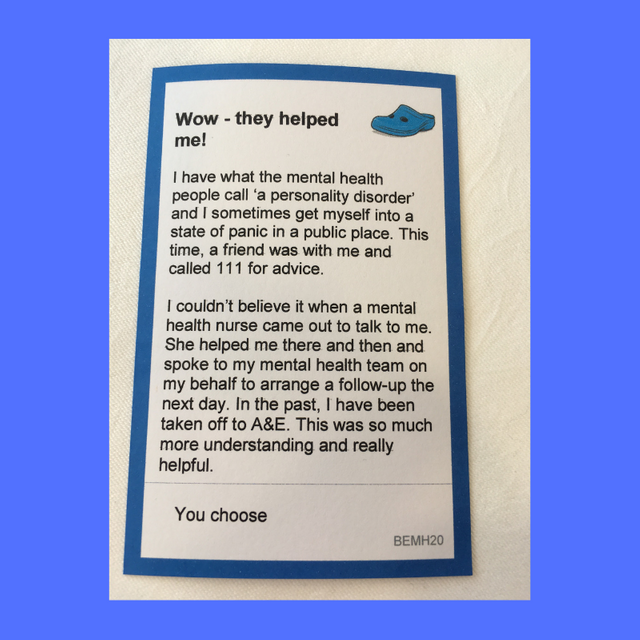 A great question, and one participants – including front-line ambulance staff, representatives from other emergency services, and people with lived experience - explored during the Whose Shoes workshop. When ambulances respond to a person experiencing a mental health crisis, they must take the person to A&E, which in the majority of circumstances is not the most relevant or appropriate place for that person to be. There needs to be better alternatives. In groups, participants discussed real life mental health scenarios, considering what needs to be changed and what needs to happen to make those changes a reality. A summary of the conversations was captured in the graphic below. We were able to have a look at a London Ambulance Service mental health car, where see senior mental health nurses and experienced paramedics working together. The mental health car is a great alternative that needs to be made more widely available. Ian and I gained some brilliant learning that we’ll be able to take forward to the #ProjectA mental health event next week (Thursday 14th February), where we’ll be co-producing actions to this issue across ambulance trusts nationally. Mental health is a huge issue, and can affect anyone. We’re keen to get a wide range of people in the room: front-line ambulance staff; staff from other emergency services; mental health professionals; people with lived experience. If you would like to attend, you are very welcome – please contact my colleague Lynsey Oates - lynsey.oates@nhs.net - to find out more. Let’s work together, share our knowledge - and make scenarios like the one below the standard rather than the exception.